Description: Colony consists of a tough basal sheet from which the zooids arise. The zooids are small and would be very inconspicuous if it were not for the fact that each one bears three bright orange or cream markings. Zooids 6mm tall x 2mm diameter. Habitat: Found from the kelp zone to 30 metres or more, usually on vertical rockfaces encrusting areas to 10cm or more in diameter. 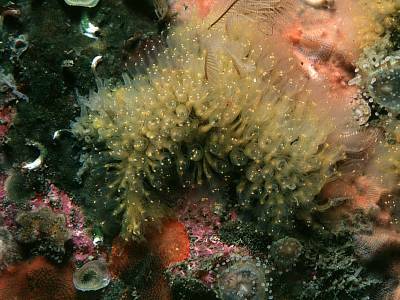 Sometimes colonies may extend up hydroids such as Nemertesia antennina. This species seems to prefer areas with high levels of water movement, exposed kelp forests or areas with strong tidal streams. Ecology: Pycnoclavella overwinters as a basal mass with no zooids, the zooids grow up in spring, produce larvae in late summer, then degenerate. Distribution: Apparently a South Western species in the British Isles, Pycnoclavella is frequent in the right habitat around south-west England from Plymouth to Lundy Is., and on the west coast of Ireland as far north as Malin Head. Similar Species: There is no other British tunicate with free zooids with markings like those of Pycnoclavella. Some polyclinids have conspicuous spots but their zooids are fused into a common test. 3 orange or white spots at top of each zooid. Picton, B.E. & Morrow, C.C. (2016). Pycnoclavella aurilucens Garstang, 1891. [In] Encyclopedia of Marine Life of Britain and Ireland.